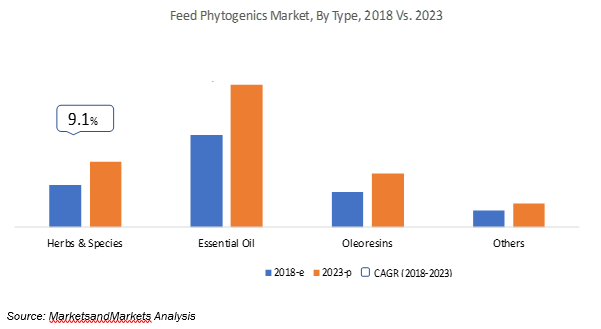 According to a recent report from MarketsandMarkets, a global market research firm, the global feed phytogenics market is projected to reach USD 962.5 million by 2023, with a CAGR of 8.8%. Growth in the field of feed phytogenics is primarily driven by advancements in the animal feed industry, including the implementation of new technologies (like encapsulation), and funding from governments and foreign direct investments (FDIs). Other influential factors driving the global market for feed phytogenics include increased demand for livestock products, rising awareness about animal health & well-being and animal feed quality, and bans on antibiotics by some of the key feed markets, such as Europe, the US, and South Korea. The intake of natural feed by livestock has been a common practice for a long time. However, over time there have been significant changes in the approach to providing natural feed, due to developments in modern livestock farming practices and increased commercialization. This supports the increasing consumption of natural feed additives such as phytogenics. Some of the key benefits associated with the use of phytogenics in feed include increased feed intake, improved gut function, prevention of diarrhea, and antimicrobial and antioxidative effects in livestock. Furthermore, owing to their holistic and broad-spectrum efficacy, phytogenics are increasingly gaining traction among nutritionists, scientists, feed manufacturers, livestock producers, and other industry stakeholders, including a worldwide consumer base trending toward clean label products like organic meat. While feed phytogenic additives have positive effects on livestock health, they can often be difficult to process. Many sources of phytogenics – especially essential oils – are sensitive substances that can lose their efficacy and efficiency after exposure to environmental factors like high temperatures, dust, significant odors, and oxidation. The emergence of new technologies such as encapsulation can extend the shelf life of phytogenics. Encapsulation is a preservation method that packs liquid, gaseous, or solid substances like essential oils within a tiny millimetric capsule, thus protecting them from environmental changes. Some of the key feed phytogenic players – including BIOMIN (Austria) and Delacon (US) – use encapsulation technologies to provide better-quality phytogenics to their customers. Encapsulation helps producers and animal growers enhance the efficacy and efficiency of livestock and is expected to further fuel the market growth for feed phytogenics. Awareness of the advantages & disadvantages of feed phytogenics for use in animal nutrition remains low among many livestock producers, especially in developing economies. 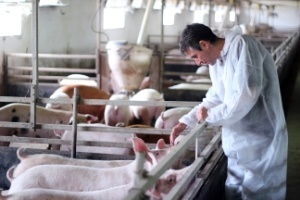 Despite R&D conducted by key players like Delacon, Nutriad, BIOMIN, and Cargill, education regarding the application of phytogenics with respect to their benefits and dosage levels for different livestock is not widespread, resulting in a low adoption rates. This can be a major challenge for the feed phytogenics market. In underdeveloped and developing nations such as India, Myanmar, Indonesia, and African countries, regulations restricting usage of lower cost, conventional ingredients like antibiotic growth promoters in animal feed are less stringent, which has led to lower adoption rates for more expensive phytogenics. However, these market challenges can be overcome via regulatory interventions by governing bodies, which can increasingly mandate restrictions on the excessive use of antibiotic growth promoters in feed owing to their ill-effects on human health and overall meat safety. For global forecasts and more in-depth information on feed phytogenics and other additives, download Feed Phytogenics Market, a comprehensive reports from MarketsandMarkets. And be sure to also take a look at MarketsandMarkets' catalog of related feed and feed additive reports. About the Authors: Bhawna Sharma is a research analyst and Nagesh Manepalli is head of Food, Beverage, and Animal Feed & Agriculture at MarketsandMarkets, a global market research firm.